The 2005 Coca Cola 600 holds the NASCAR record for most cautions in a single event (22), and after lasting well over five hours, it ended in a spectacular photo finish. The 2005 Coca Cola 600 is one of those special few events that have been immortalized. To celebrate the weekend that lays directly ahead of us, I am going to take you through that bizarre 600 and relive the events that took place on the high banks of Charlotte Motor Speedway on May 25th, 2005. 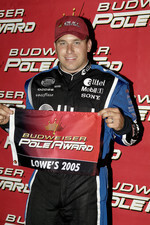 The race kicked off in the daylight with Ryan Newman and Jeff Gordon leading the field to the green flag. Seven laps were laid down before the caution flew and the safety vehicles deployed. Martin Truex Jr. rubbed the wall, it was nothing major really. But it was the predecessor to a night that would go down as one of NASCAR's wildest in history. The first 100 laps were fairly subdued and nothing peculiar occurred. As Kyle Busch defended the lead against then-teammate Jeff Gordon however, a multi-car pileup ensued on the backstretch. No big names collected, but the free pass did go to 2000 NASCAR Sprint Cup champion Bobby Labonte ... you're going to want to remember that name for later. The next 100 laps or so were marred by crash after crash - ten cautions alone flew between lap 115 and 240. The photo to your right is the result of a collision between Chip Ganassi Racing teammates Casey Mears and Sterling Marling, but that incident would not be the last clash between teammates on this night. The very next caution was for the third Ganassi car, piloted by Jamie McMurray, who went for a spin out of the second corner. 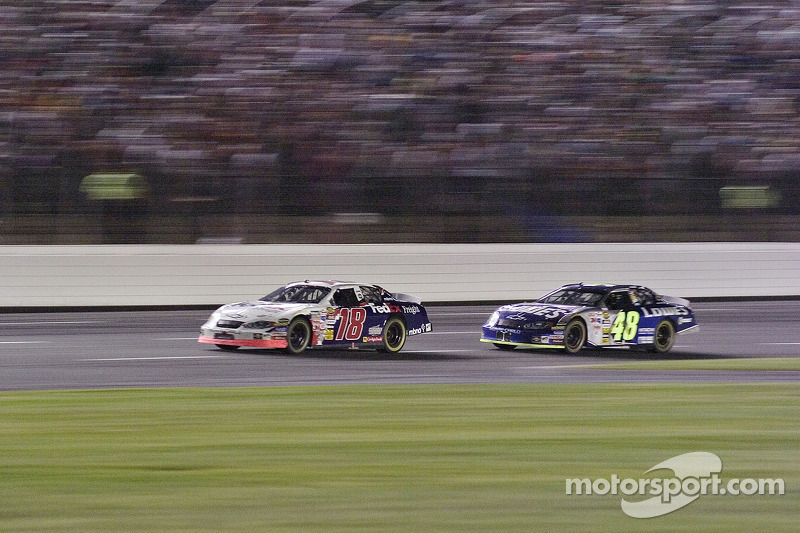 On the 247th lap, Dale Earnhardt Jr. and then-teammate Michael Waltrip were battling for position. A misjudged crossover move by Jr. sent Waltrip spinning wildly down the frontstretch. Both Waltrip and Earnhardt were out of the race due to damage. procured during the incident. Former series champions Matt Kenseth and Terry Labonte also got swept up in it and had their nights ended prematurely. Terry's brother Bobby was able to weave through the chaos and just barely avoid the out of control race cars. There's that name Bobby Labonte again ... keep it in the back of your mind. When the race returned to green flag conditions, the carnage began to dwindle and everyone finally got the chance to take a breath after 375 miles of almost non-stop destruction. The cautions continued to trickle in but they were for minor things such as a piece of debris or oil on the track. When Kasey Kahne blew a right front tire and threw debris all over the track, NASCAR was forced to display the yellow once more. How was this yellow significant? Well, it happened in the middle of green flag pit stops and just like that, the running order was turned upside down. All four Hendrick cars were trapped deep in the running order, as were many other top contenders. One driver was told to pit by his crew chief seconds before the caution was displayed but the driver called an audible and waited a little bit after seeing Kahne limping around the apron. His name is Bobby Labonte and he now ran second to Carl Edwards as a result of that decision. Because of when the caution flew, the leaders were forced to restart in the middle of the pack which was an odd sight. NASCAR has since implemented the wave-around rule to avoid such situations. On lap 364, Joe Nemehcek asserted himself as the leader and surprised a lot of people when he quickly established a comfortable gap between he and his rivals. With the drivers tired and the race running incredibly late, tempers began to flare. Under caution, Carl Edwards and Dale Jarrett got into a shoving match with their cars over some contact earlier. Another massive pileup took place with just twenty laps remaining. 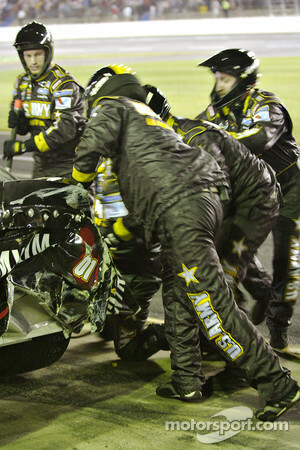 Seven cars in total received damage including notables such as Jeff Gordon, Brian Vickers, Kevin Harvick, and Mark Martin. Jimmie Johnson was lucky to be directly in front of the accident. The drivers behind him weren't so fortunate. That wreck officially broke the NASCAR record for cautions in a single race - a record that stands to this day. And they weren't even done tearing up equipment yet. Suddenly, without warning, race leader Joe Nemechek lost control and backed it into the wall, sliding down the track and into the path of Jimmie Johnson. The No. 48 somehow made it through the blinding smoke, inches away from a horrific impact. There were just ten laps to go at that point and Joe Nemechek has not won a race since. The lead was put into the hands of ... you guessed it, Bobby Labonte. On an interesting side note, his well-known green Interstate Batteries car was decked out in FedEx logos for this race because his teammate Jason Leffler, who had originally carried the scheme, missed the race. The company then made a deal with Gibbs to be placed on the No. 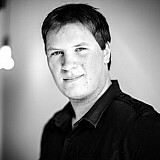 18 car. Below are photos of Labonte's car from the first practice session, and then after qualifying. 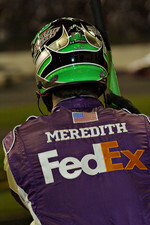 You will also notice a photo of a crew member with an Interstate Battieres helmet and a FedEx firesuit; a very peculiar sight. 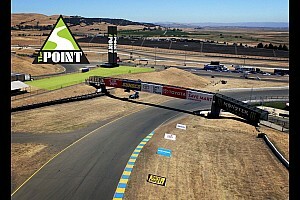 The race was red flagged with nine laps to go and the commentators decided to speak with race leader Bobby Labonte, but as they quickly found out, he wasn't in the mood for chatting. "You got me Bobby?" "Yeah." "Do you think you can you hold him off?" "I'm gonna try." "How good is your car? As good as it's been all night I guess?" "Yeah." He was so focused, so incredibly deep in concentration and immersed in what he was about to do. It's like nothing else even existed. He knew he had the inferior car, but he was not about to bow to the odds. That weekend was the tenth anniversary of Labonte's maiden win at the Cup level, which came at that very track. He knew that behind him, he had a hungry rookie in Carl Edwards and the real threat being Jimmie Johnson. Johnson was going for his third straight win in the Coke 600, and sat ominously in fourth with the freshest tires out there (He also had one of the best cars to begin with). Nine years and an astonishing 353 races later, former Sprint Cup champion Bobby Labonte has yet to win another NASCAR race. The 2005 Coca Cola 600 was a bizarre event that will stand out above the rest for quite a long time; always to be remembered when this race comes around again. A record number of cautions, teammates wrecking each other, drivers feuding under caution, veterans vs. young guns, and a photo finish to top it off. This was a race that surpassed the five hour mark, yet it ended with a mere 36 inches separating first and second place. Jimmie Johnson enjoyed the sweet taste of victory lane champagne that night, while Bobby Labonte endured the bitter agony of defeat, kicking the side of his car in disgust. One went on to become a six-time Sprint Cup champion while the other slowly faded out of view. One seeks NASCAR immortality with a seventh title, and the other simply dreams of one last shot at NASCAR glory.